With few quick and easy tips, microwave cleaning would not be a hard work anymore. Microwave oven is a household appliance that has revolutionised modern home kitchens.Few years ago, the humble device was used just for heating up leftovers or making some quick popcorn. But today, there are many things that microwave does really well in culinary world. When you are facing short of time, this device can even venture into the life-saver category. From weekday boiled eggs to fluffy mug omelettes, quick snacks and side dishes to easy cupcakes, all that stands between you and plunging a fork into these scrumptious dishes, is all those few minutes. The cooking technique of microwave is really a game-changer. So do not use it to only heat leftovers but tap into its awesomeness. You can make brownies, potato chips, cheesy macaroni, saucy pasta, idlis and even bake a lasagne in the microwave. But it is horrible to cook in a dirty microwave. If you use your microwave for cooking, then of course the leftover bits will get stuck to its top, bottom and sides. The stains of explosive red sauce, remnants of frozen chicken, macaroni cheese, soup spills and unidentifiable oily film cover the microwave corner to corner from inside. And if you do not make a move to clean it, this mess becomes rock-hard with time. Every time you use a messy microwave, you will see food filth snow-boiling with the fresh food you are cooking. Do you think there would be no health risk in using a dirty microwave because of the heat sterilisation – right? You are wrong. Microwaves (inside and out) are swamped with germs, both from leftover food bits and our own skin contact. If many people are sharing a common microwave like in an office, its door handle will be one of the dirtiest surfaces (you better reach for soap and water before handling your hot food). Also the heating power of microwave does not sterilise its contents. Using a microwave can really trigger a bout of food poisoning or the stomach flu. So keep the inside as well as outside clean and germ-free. Microwave cleaning is not a hard work anymore. · Mix one cup of vinegar with one cup of water. Place it inside the microwave in a microwave-proof bowl. Turn the microwave on for five minutes. Do not open the door immediately after turning off. Let the steam remain trapped inside for three to five minutes to loosen the food gunk. Then open the door and wipe the inside with a clean wet sponge. · Take a lemon. Cut it into two halves. Take one cup of water in a microwave-safe bowl. Squeeze the whole lemon in this water and drop the remaining squeezed lemon halves into the bowl. Now place this bowl inside the microwave and turn it on for five minutes. After five minutes, do not open the microwave. The steam trapped inside will loosen the rock-hard food stains and oily film. Take out the bowl and the turntable. Wipe off with a clean wet rag. If there are still few stubborn spots, dip your rag in warm lemon water solution and scrub the spots until they go away. · Take a spray bottle. Fill it with a couple of ounces of water and about five to seven drops of lemon essential oil. Spray this mixture liberally all over inside of your microwave. Turn on your microwave for three minutes. After turning it off, leave a clean wet sponge inside with door closed for few minutes, until the sponge is cool enough to handle. Then grab it and wipe out every spot inside. All the gunk and grime would slide off easily. You will get a clean and fresh-smelling microwave. While you are wiping your microwave from inside, do not forget to wipe down the door and outside surface. If you want to make the outside really shine, pour a bit of the rubbing alcohol onto a microfiber clean cloth to wipe and buff the outside of your microwave to an ultra-shiny clean. After cleaning, put the turntable back carefully. Try applying these easy tips to get a squeaky-clean microwave. There is no need to use harsh chemicals in a device we cook our food. 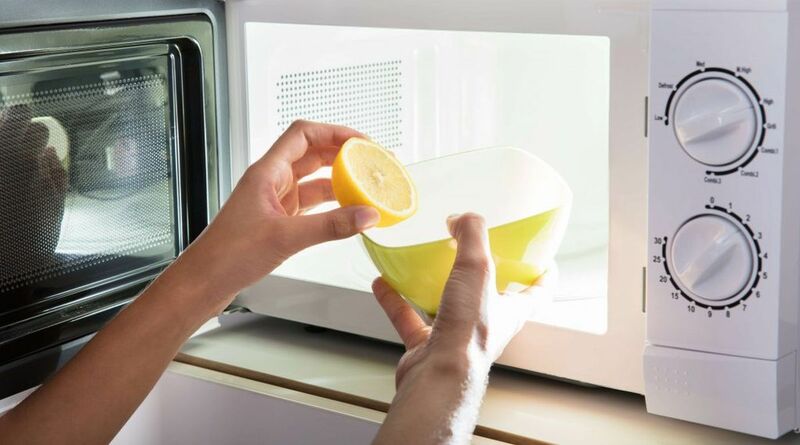 Go happily and safe with these microwave cleaning solutions. Spread love and health by forwarding these tips to your dear ones – they will thank you come cooking time in a nicely clean microwave.